Provide comfort for the family of Reba Isgriggs with a meaningful gesture of sympathy. Reba Mae Isgriggs of Belgrade, Missouri, was born on August 20, 1935 in St. Louis, Missouri, a daughter of the late Clarence E. Gibson and the late Hilda Mae (Hawkins) Gibson. On March 29, 1953, Reba was united in Holy Matrimony to H. Wayne Isgriggs and they shared nearly sixty-six years together. On Monday, January 21, 2019 Reba went to her Heavenly home at the age of eighty-three. Reba will be missed by all who knew and loved her including her loving and devoted husband, Rev. H. Wayne Isgriggs; three children: Cherilynn Mae (David) Pirtle, Joseph Wayne (Donna) Isgriggs, Carole Beth (Tom) Garth; seven grandchildren: Bridgette (Ryan) Davis, Ashley (Casey) Cummings, Jill (Aaron) DiVirgilio, Freedom (Ryan) Beashore, Joshua (Brittany) Isgriggs, Caleb Isgriggs, Derek (Mallory) Garth; eight great grandchildren; two sisters: Delsie Gibson and Donna Miller; sister-in-law and brother-in-law: Lana and Art Maxwell; also surviving are nieces, nephews, extended family, church family and friends. Reba is preceded in death by her father and mother, Rev. C.E. and Hilda Gibson; beloved daughter, Shelba Jean Isgriggs; brother, Lynn Gibson; father-in-law and mother-in-law: Howard and Thelma Isgriggs. The family will receive friends on Thursday, January 24, 2019 from 4:00 to 8:00 PM at the DeClue Funeral Home. Visitation resumed Friday, January 25, 2019 from 11:00 AM to 1:00 PM at the Potosi Southern Baptist Church. A Funeral Service was conducted Friday, January 25, 2019 at 1:00 PM at Potosi Southern Baptist Church with Pastor Rick Posey officiating, assisted by Elder Leonard Compton. 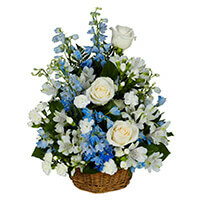 To send flowers in memory of Reba Mae Isgriggs (Gibson), please visit our Heartfelt Sympathies Store. Bill and Crystal Lynch, Chuck and Judy Cummings, and others have sent flowers to the family of Reba Mae Isgriggs (Gibson). Dear Wayne and family, Time and distance placed a gap in the time since I saw Reba. I will remember her always as a positive and caring person I knew and cared for. There are such good hearts in your family. I am so sorry for your loss and hope for your comfort. Bro. Wayne and family, You are in our thoughts and prayers during this difficult time. We know that you are blessed with wonderful memories and God's great grace and peace. You are in our prayers, we both love you. Bill and Crystal Lynch purchased the PEACEFUL WISHES BASKET for the family of Reba Isgriggs. To the Isgriggs family I send you my sincere condolences for the loss of Reba. I will always remember what a sweet person she was. May the lord be with you in your time of grief.